Hotel Innside by Melia, Berlin. 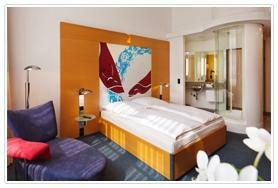 Innside by Melia Hotel Berlin. This modern hotel offers 133 unique guest rooms and suites that overlook a peaceful courtyard setting, and offer an open plan setting with bathrooms featuring glass showers or bathtubs. This centrally located hotel is found in the Friedrichshain district of Berlin, close to the S-Bahn, and a quick 5 minutes away from Alexanderplatz. It is also only 3 minutes walk from the Station Ostbahnhof and has easy connections on the ICE, regional and S-Bahn rail, making ideal for both leisure and business travellers to get around the city with ease. Hungry traveler? Come to the restaurant "InterMezzo" that serves up a delicious buffet breakfast and International cuisine, sure to please all palates. Top it off with a choice from the vast drink menu at the bar.